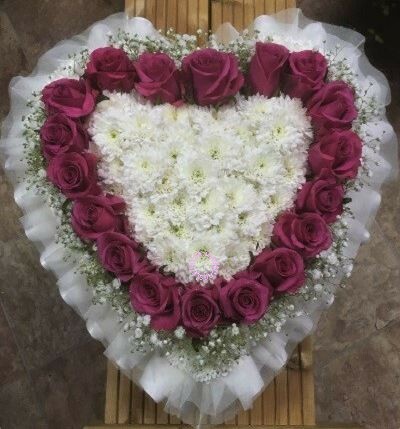 The Heart is usually sent to express eternal love and remembrance. An all white heart with a small red rose spray and single rose linked with grass. 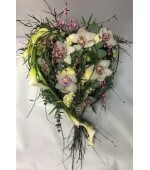 A textured style heart with a mix of grasses, orchids, foliage and willow and calla spray. 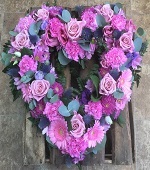 Please state your preferred colour. 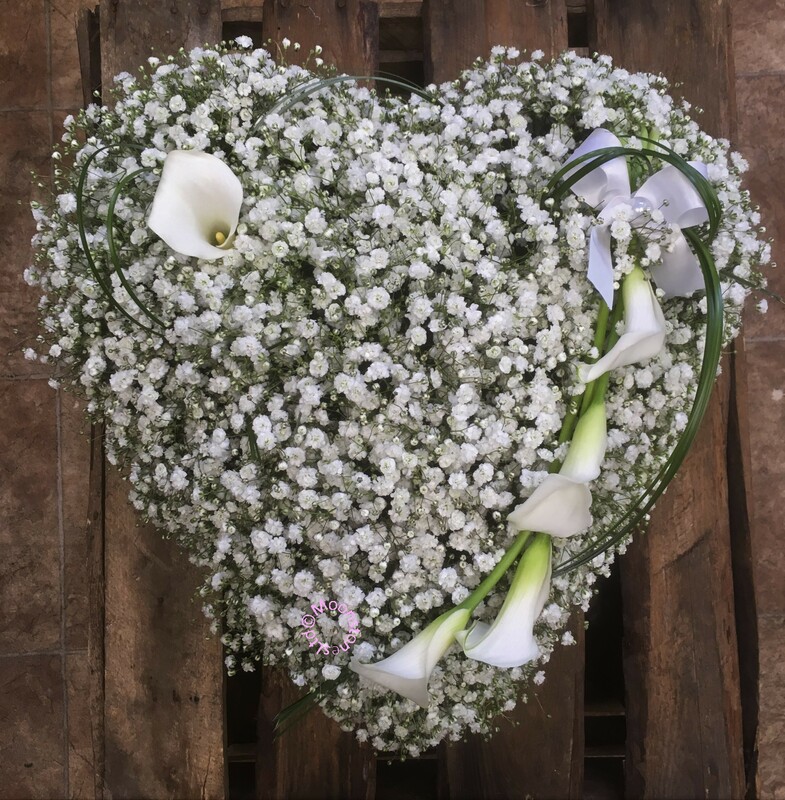 A solid heart with an all gypsophylla base, and simple calla lily spray. 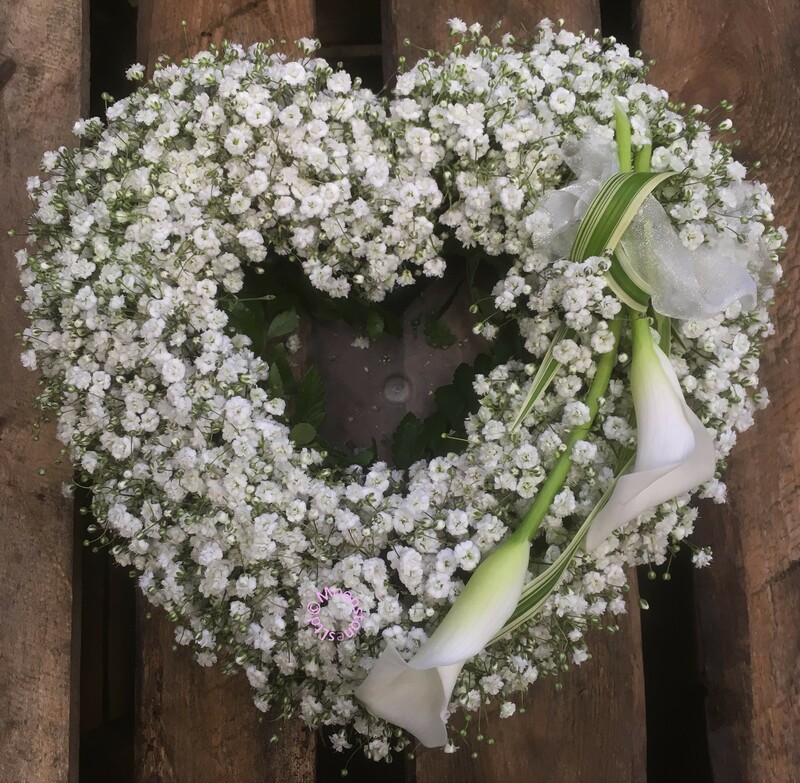 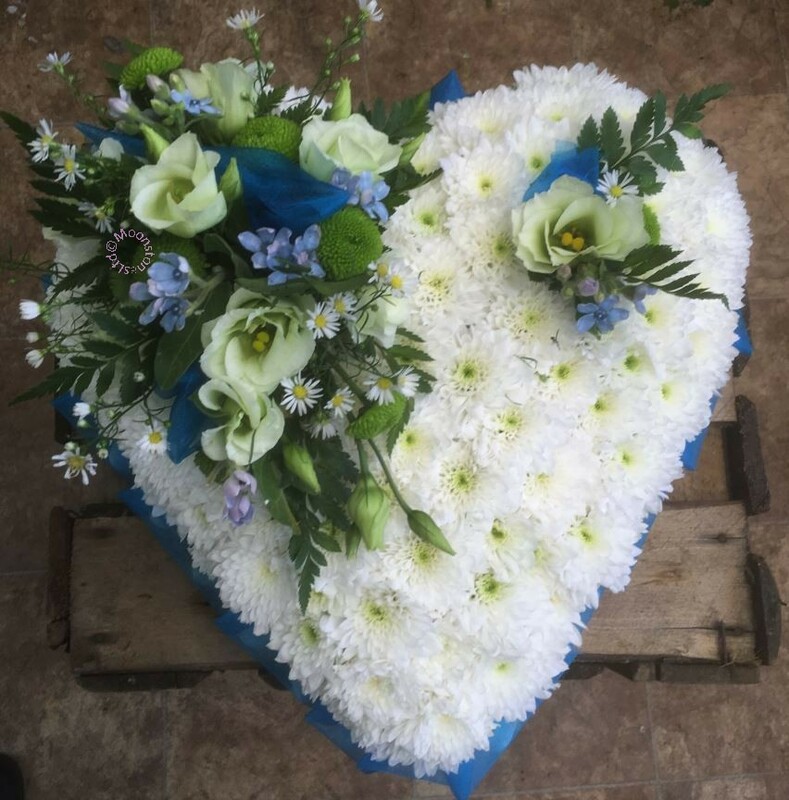 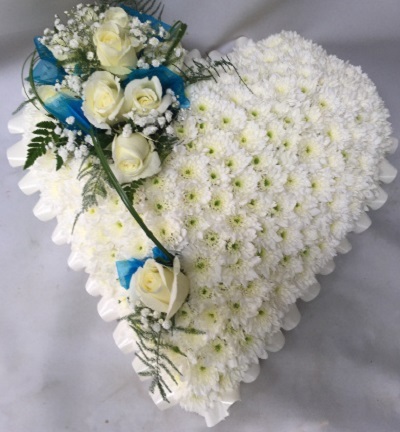 A white based heart with a white flower spray and touch of blue to complement - if you would prefer another colour please let us know. A based heart in cerise pink and white. A simple heart with a white ribbon edge, white base and cream spray. 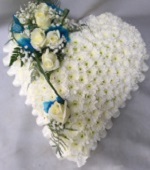 A based heart with a blue ribbon edge, white base and a blue and green spray. 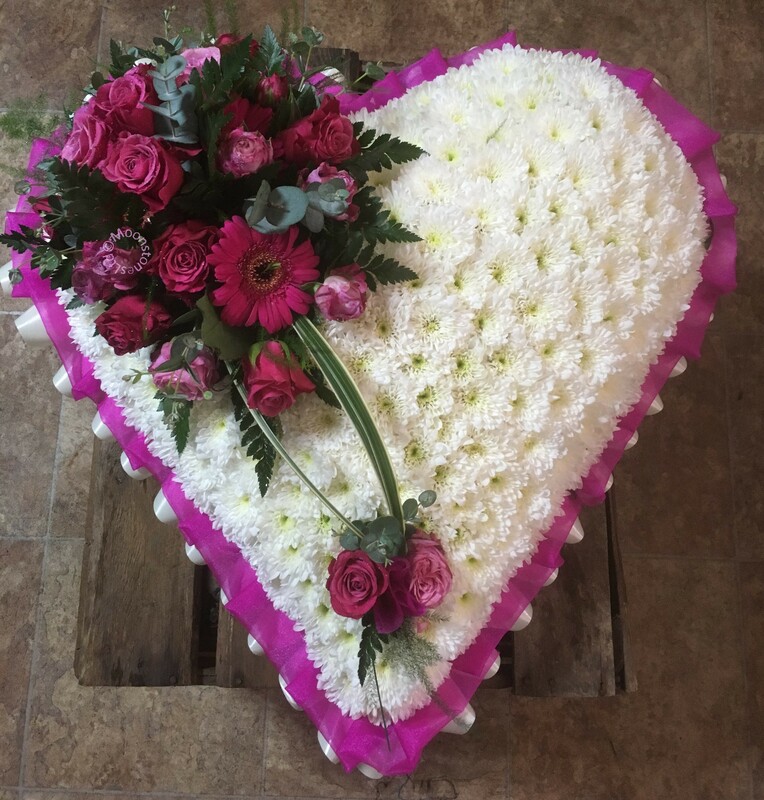 A white based heart with pink ribbon and gyp flowered edging and pink shaded flower spray. 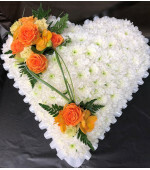 A white based heart with a white ribbon edging and an orange with yellow spray to complement. 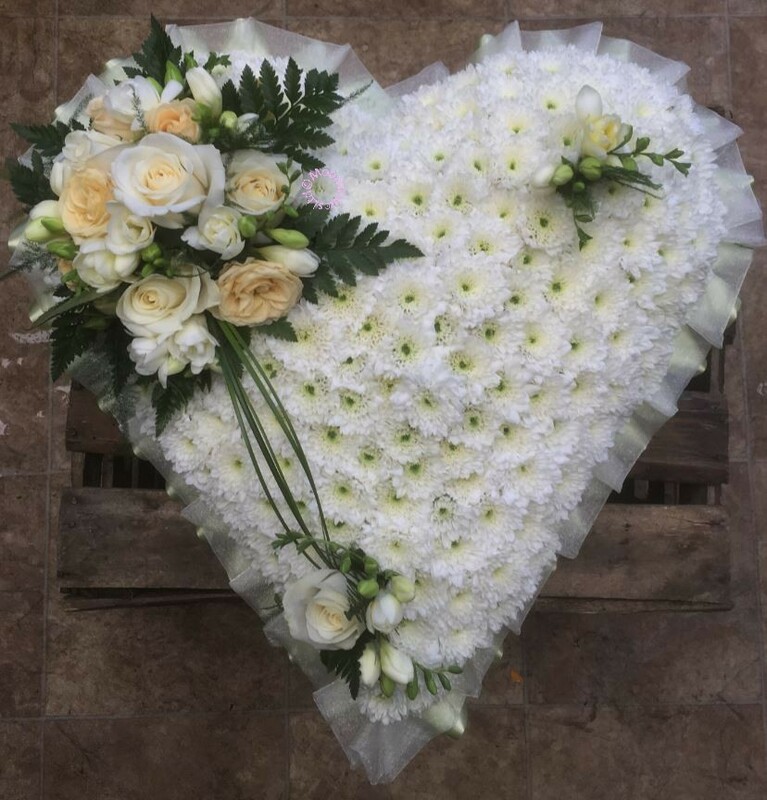 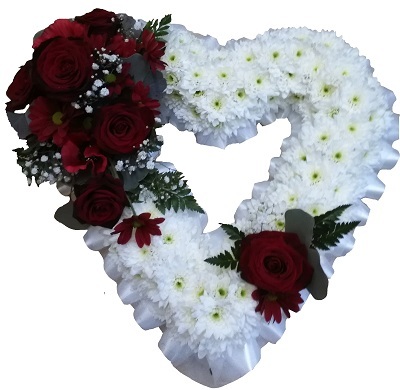 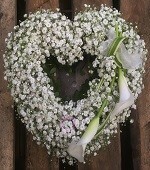 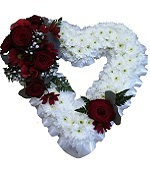 A white based heart with a rose outer edge - please state when ordering if you would prefer a different colour rose. 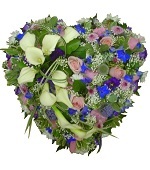 This heart has a mixed flower base in shades of pink and blue, with a white calla lily spray. 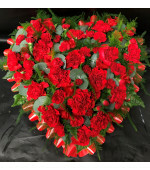 Sizes are approximate. 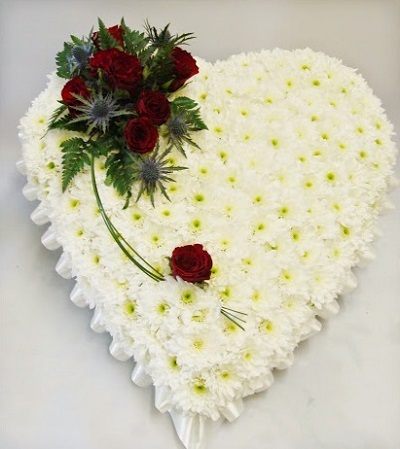 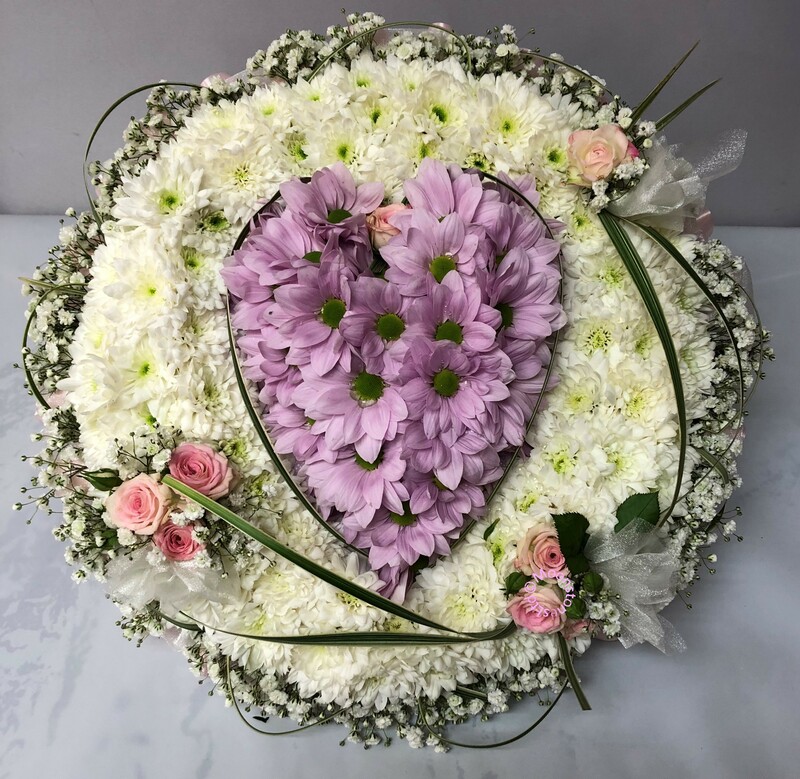 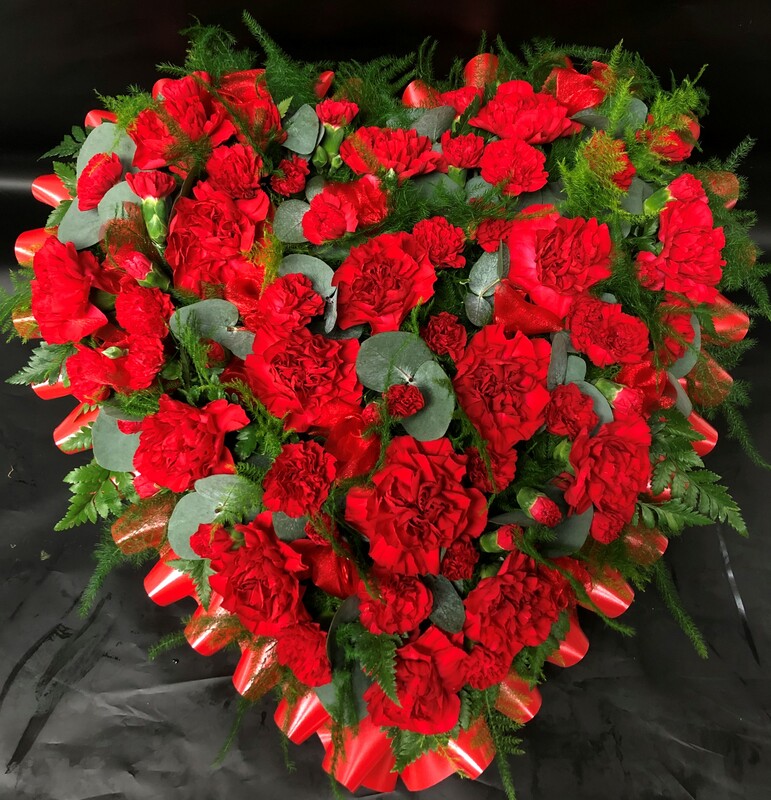 A full heart shape based loosely in carnations and spray carnations with foliages to tone. 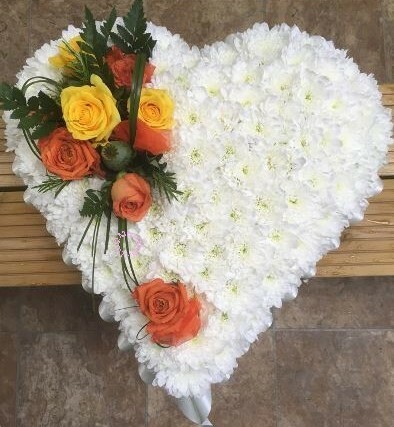 Please state your colour preference when placing your order. 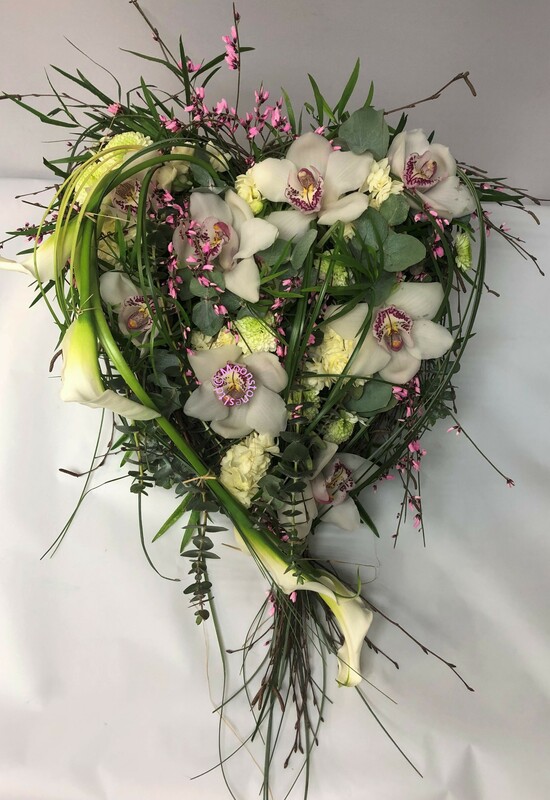 An open heart with a gypsophylla base and simple calla lily spray. 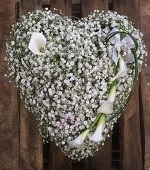 A loose flowered open heart of mixed seasonal flowers. 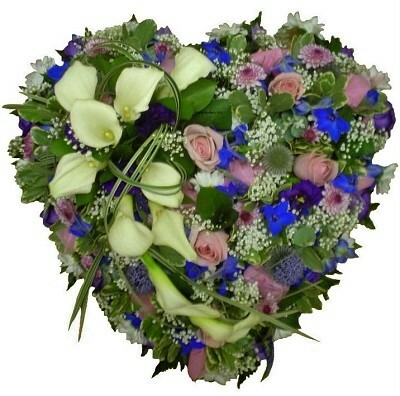 Please state your colour preference when placing your order. A ribbon edged based open heart with a rose spray. Please state your colour preference when placing your order. 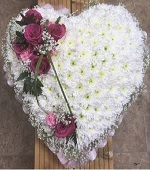 A heart shape within a based posy & sprays to complement. 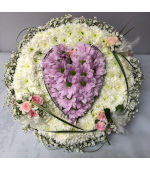 Please state your colour preference when placing your order.